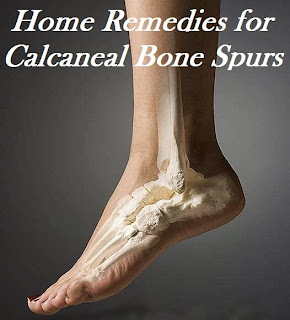 Are you looking for relief from your calcaneal heel bone spurs? Do you want to avoid costly surgery? There are other ways to find relief from heel pain caused by heel bone spurs. But before we discuss treatment lets look at what causes the spurs on the calcaneal, and what is the true source of pain. Then I will give you some home remedies that you can try. Many of these remedies can be used with things you have around the house. The heel pain you are experiencing is most likely from the inflamed ligaments in your foot. what happens is that excess pressure on the fatty pad in the heel of the foot triggers the body to create a calcium deposit on the calcaneal bone. This calcium deposit is pointy and pokes the ligaments in the foot causing painful inflammation. Those most likely to suffer from heel spurs are middle aged men and women, those who are overweight, athletes, and people who wear shoes with little or no support. There are ways to decrease the inflammation and rest from heel pain. If you can you need to rest your foot. Sit down and apply ice to reduce inflammation. Or 20 minutes of heat can also increase blood flow and this will reduce inflammation. Another home remedy is to make a paste of flaxseed and apply it to your heel. For chronic heel spur pain you may need something different. Many chronic sufferers turn to oral pain killers, but these may have undesirable side effects. So what other options are there for calcaneal bone heel spurs? Remember that the initial cause of the bone spur growth is pressure on the fatty pad in the heel. By providing extra cushion in the heel area the pressure on the fatty bad is lessened and the inflammation of the ligaments decreases. There are heel inserts you can buy and place in your shoes. Or you may choose to invest in shoes that provide more padding in the heel area of the foot. If you are overweight you may find relief from heel spurs by losing weight. Some heel spurs cause pain in the arches. If this is a problem for you foot exercises that stretch out the ligaments may be the answer for you. One exercise that helps relieve heel spur pain is to roll your foot over a water bottle. For more relief freeze before use. Or you may choose to purchase a foot roller, or foot rocker. Some even find relief from applying special creams made to relieve heel spur pain. How Can You Care For a Slow Healing Open Wound? How to Lose Face Fat and Double Chin? Fasting: Does It Have Any Health Benefits? Top 10 Homeopathic Remedies for Eye Problems! Is Your One Eye Stronger Than the Other?